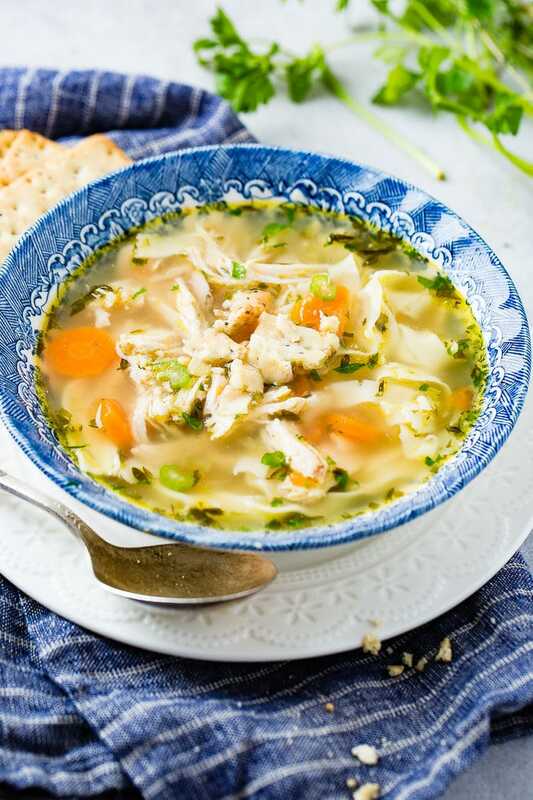 I mean, I don’t know your Grandma or her soup, but after year’s of disappointing chicken noodle soups this Instant Pot Chicken Noodle Soup is worthy of the blog! Seriously, I have had one billion chicken noodle soup recipes. I feel really bad saying this, but I’ve really never enjoyed any at all. That’s not true, I got the best recipe ever once, but it was years ago from one of our landlords, Adele, and I’ve since lost it. Ugh, such a bummer. Usually they taste so bland and the celery is too crunchy for my liking. Not this one, one missing ingredient changed everything. I was out of onion. I don’t know how it happened, but I was. Who doesn’t have an onion on hand?? I’m a huge fan of mirepoix for soups, slowly cooking up celery, carrots, onion and garlic for soup to add a great base of flavor. However, with no onion, things would have to be different. Once there wasn’t onion I didn’t really feel like peeling garlic either so I hit the cupboard for garlic powder and noticed half an envelope of onion soup mix. On a whim I threw it in and my goodness, it was amazing!!!! 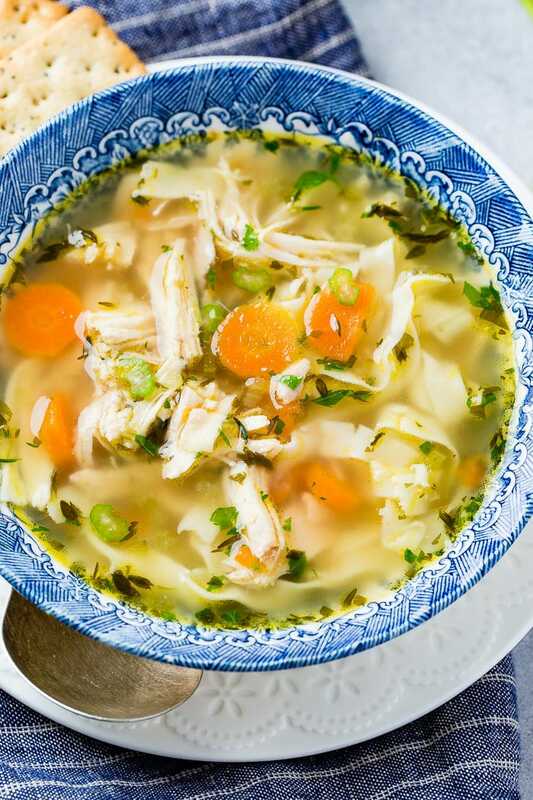 The best chicken noodle soup recipe ever. And there’s nutmeg in there too. It gives an extra earthy warmth that the soup usually lacks. We start by sauteing the vegetables in the Instant Pot, so set your Instant Pot to the “Saute” mode and make sure the heat is moved to “More”. Pour the olive oil in first and then add the celery and carrots. Saute those for a couple of minutes and then add the onion soup mix, herbs, and other seasonings and stir for 20-30 seconds. The next step is to pour in the liquid to create the broth. 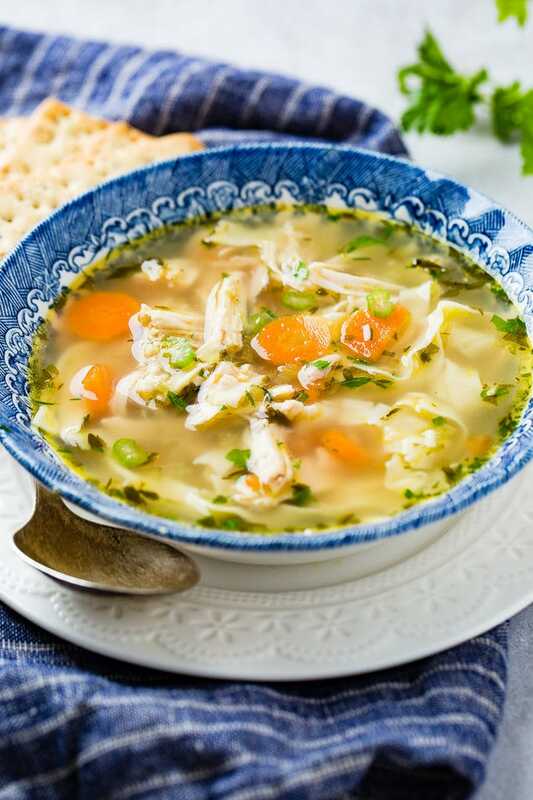 We like to use Better than Bouillon and water, but you can use chicken stock as well. Then you add your shredded rotisserie chicken and put the lid on the Instant Pot with the valve set to seal. 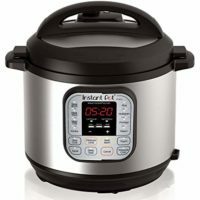 Now you will turn off the Instant Pot and then turn it back on and set it to “Soup” for 7 minutes. At this point, you switch the Instant Pot to a quick release by turning the valve to “Steam”. Do this carefully so you don’t get burned by the steam! 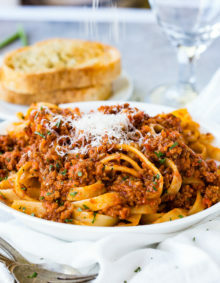 Once the steam has released, remove the lid, turn the Instant Pot back to “Saute” and drop in your fresh noodles (instructions for making fresh pasta below). Then you can season to taste with salt. The noodles should take just a minute or two to cook, and then it is ready to serve! We like to use a dutch oven for soups like this like our most favorite pot ever, but any pot will do. Heat the pot over medium heat and then add the olive oil. When the oil is hot, add the vegetables and saute them for a minute or two. Then you proceed with all the same steps listed for the Instant Pot method. 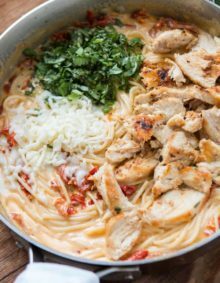 Once you have added the shredded rotisserie chicken, cover your pot with a lid and cook for about 30 minutes over medium low heat. When the carrots are tender, you drop in the fresh noodles and allow them to cook for a minute or two. Salt to taste and bon appetit! If you want a better flavor and have the time, saute the vegetables on the stove top before adding them to the slow cooker. If you don’t have the time and just need to get something cooking, add everything to the slow cooker and cook on low for 3-4 hours. Add the noodles to the slow cooker and allow them to cook with the lid on for a few minutes. You can salt to taste and then serve as normal. While in Italy we got to make homemade pasta and it was so simple, but my goodness, once you have fresh pasta you can’t ever go back to dried. It’s a cinch to make and it MELTS IN YOUR MOUTH! Who doesn’t want that?! The more you make it the more familiar you become with how the dough feels. 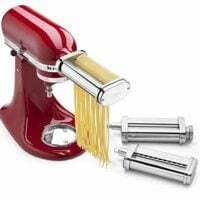 If you’re putting it through the pasta roller and holes and tears are showing up, just fold the two ends towards, but not overlapping each other and continue putting it through and folding it until it’s smooth. It just needed a little extra time. If you don’t have a pasta roller, you can use a rolling pin, but make sure that you roll it super thin! If you want to make the pasta dough ahead of time, make it just as stated in the instructions. Then wrap it in plastic and store in the fridge up to 1 day ahead of time. Let it sit out on the counter for 15-20 minutes before trying to roll it. 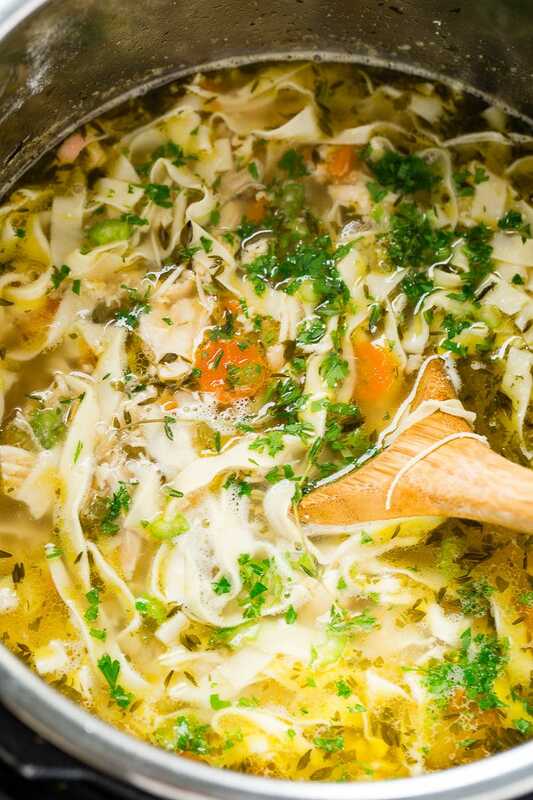 If you like your chicken noodle soup with less pasta, you can save some of it for later. Make the pasta as directed and cut it to you desired width. Toss the pasta you want to save in flour and store it in a sealed bag. It can be stored in the freezer for up to one month or in the fridge for up to 15 hours. Never store it on the counter for more than an hour. As mentioned, homemade pasta is good for up to one month in the freezer or 15 hours in the fridge. If you store it longer in the fridge, oxidation and water movement will cause the pasta to start to clump and get a green-ish hue. And trust me, you don’t want any part of eating that! This is where I issue a challenge to you all! Make this recipe and then let us know if it’s just as good or better than what your grandma used to make! We are dying to hear what you think! 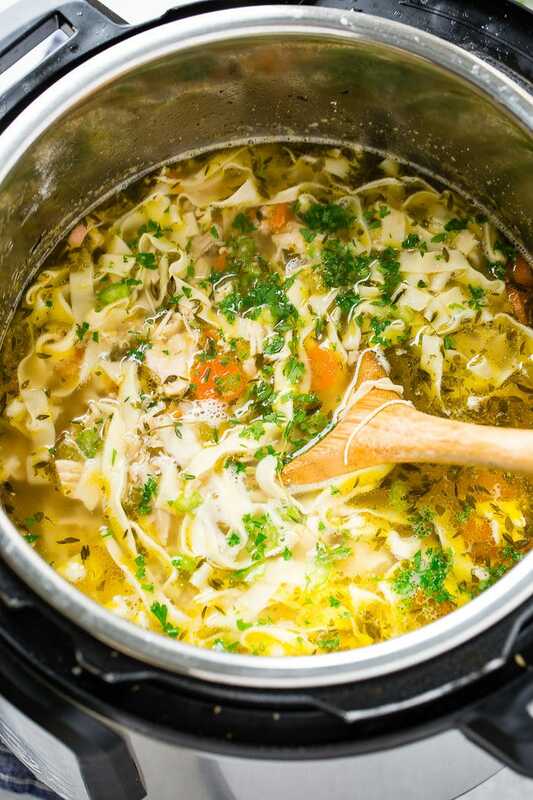 A simple but flavorful instant pot chicken noodle soup that can easily be made stove top or in a slow cooker! Dump the flour on a clean counter top. Make a well in the center of the flour and add the egg, oil, water and salt. Using a fork, start pulling the flour into the egg and stirring to combine. Switch to you hands and start to knead the dough together, folding and pressing with the palm of your hand. Continue to knead for 3 minutes. The dough will feel tough, but keep going. Wrap tightly in plastic wrap and set aside for 45-60 minutes. Unwrap the dough and use a pasta maker to roll it thin starting at 1 and moving through 5 or 6. Switch to fettucini or wide egg noodle attachment and cut the dough. Cut these pieces into smaller bits by holding the strands over your fingers with the fingers all pointing towards your chest, and then pulling them apart to break the noodles. Heat the instant pot to Saute and make sure the heat is moved to "More" so it gets hot enough. Add the celery and carrots and saute for 2 minutes, stirring occasionally. Add the soup mix, herbs and seasoning. Stir and cook for 20-30 seconds. Quickly add the better than bouillon and water and stir. Add the chicken and place the lid on with the valve set to seal. Turn the pot off and then back on to soup for 7 minutes. Switch to a quick release of the steam by turning the valve to steam. Stand back to not get burned. Turn the pot back to saute and drop in fresh noodles and season to taste with salt. Serve once they are cooked which should take a minute. Heat a pot over medium heat and add the oil. Once hot, add the veggies and saute for a minute or two. Once the chicken has been added, cover with a lid and turn to medium low heat. Allow to cook for 30 minutes or until carrots are tender. Proceed with the recipe as normal. You can saute the veggies on the stove top for better flavor like above or skip it and add everything to the slow cooker, cooking on low for 3-4 hours before dropping in the noodles and salt and serving as normal. Fresh pasta tossed with a little flour and place in a sealed bag can be stored in the freezer for up to 1 month. 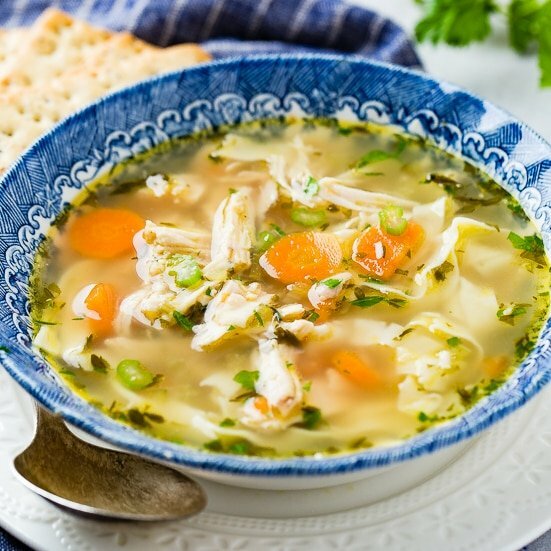 Looking for a few different soup recipes other than our Better than Grandma’s Instant Pot Chicken Noodle Soup? 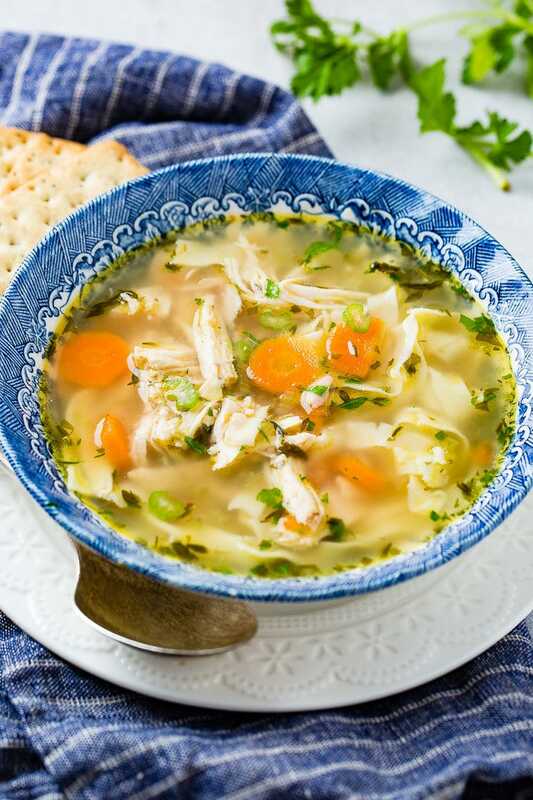 Here are just a few to get you started: Irish Beef Stew, Slow Cooker Potato Broccoli Corn Chowder with Bacon, Instant Pot Taco Soup, Roasted Tomato Basil Soup, Chicken Pot Pie Soup, Brown Butter Cauliflower Soup, Taco Stew, and finally, Cheesy Southwestern Chicken Tortilla Soup. If you’re looking for another comfort food meal made in the Instant Pot, try this pot roast recipe! 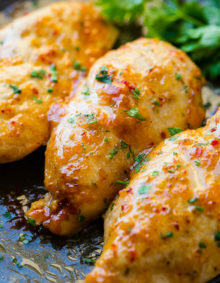 How would you add chicken breasts of i don’t have a roti chicken? Still cook before hand ? Yes, completely cook the chicken beforehand. I would either pan cook them on the stove top or bake them in the oven…375 for 20-25 minutes. What size package of dry pasta would you use?